Well, of course Warner Brothers was going to tap TT Games to make a LEGO video game for Jurassic World. It was an inevitability. Today we have a teaser trailer for the game, and its charm and humor are apparent within only a few seconds. Yep, this is a LEGO game. We received a link to the trailer you see above alongside a press release regarding LEGO Jurassic World and what it includes. It's good news for fans of either LEGO games or Jurassic Park. This LEGO game won't just cover Jurassic World, it will cover all four Jurassic flicks. Following the epic storylines of Jurassic Park, The Lost World: Jurassic Park and Jurassic Park III, as well as the highly anticipated Jurassic World, LEGO Jurassic World™ is the first videogame where players will be able to relive and experience all four Jurassic films. 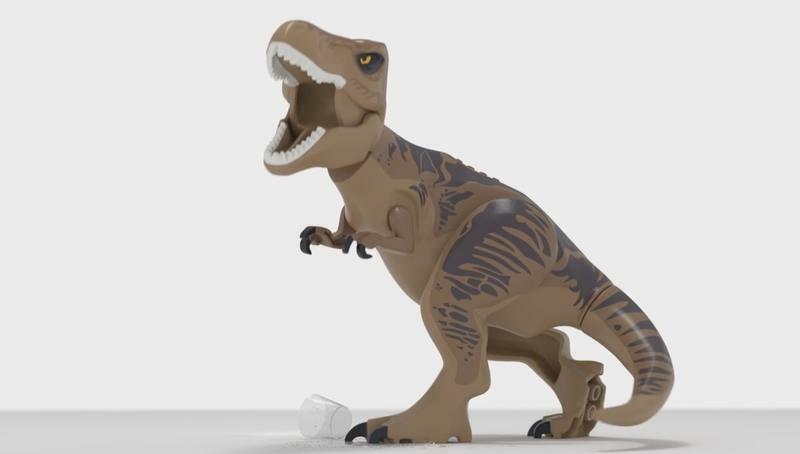 Reimagined in LEGO form and told in TT Games' signature classic LEGO humor, the thrilling adventure recreates unforgettable scenes and action sequences from the films, allowing fans to play through key moments and giving them the opportunity to fully explore the expansive grounds of Isla Nublar and Isla Sorna. Since it's a proper LEGO game, LEGO Jurassic World will launch for just about every platform under the sun. That means we'll be able to play it on the Xbox One, Xbox 360, PlayStation 4, PlayStation 3, PS Vita, Wii U, Nintendo 3DS and PC platforms when it drops in June of 2015. We'll have more on the game as it comes.